Parenthood can be a blissful and stressful time in a mom's life and in POPSUGAR Insights' #Momstamina study, we wanted to know the current state of moms' happiness and what exactly makes them happy. We found that 45% of moms say they are more stressed than they should be, 28% feel they are as happy as they should be, and 33% overall feel they have a really great life. What makes a mom the happiest about being a parent is her child's happiness (68%), her child's health (46%), and spending time with her child (40%). What does not make a mom happy and stresses her out the most is worrying about having enough money to support her family (42%), her child's future (16%), and ensuring that her child is healthy (13%). 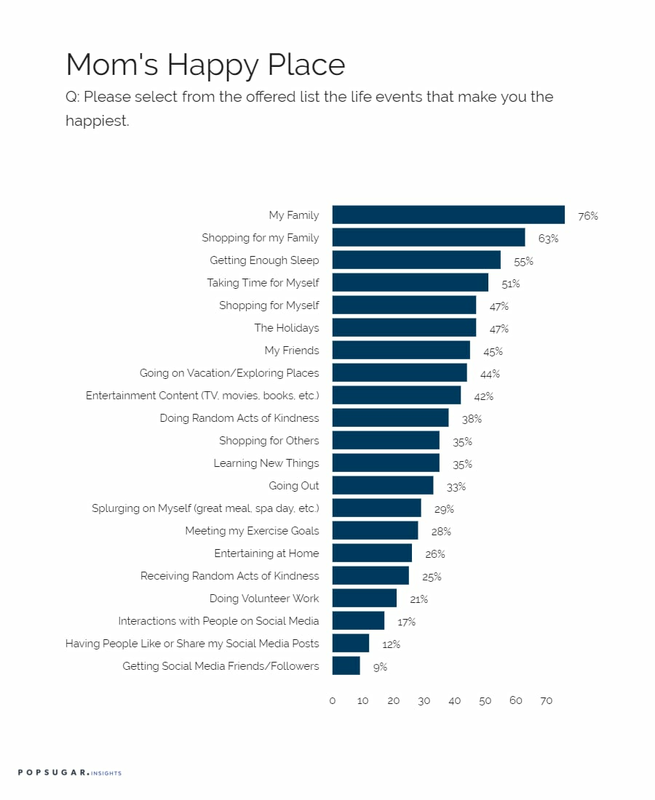 When asked what life events make moms happy, family comes first (76%), followed by shopping for children (63%). A mom also needs to carve out time for self-care activities like getting enough sleep (55%), taking time for herself (52%), shopping for herself (47%), and going on vacations or exploring new places (44%). Being social is an important part of her happiness too, as 45% of moms enjoy spending time with friends, 47% love the holidays, 35% like learning new things, 33% delight in going out, and 29% splurge on themselves to put a smile on their face. At the other end of the spectrum, social media recognition is not at the top of moms happy list. Interactions with people on social media (17%), having people "like" or share their social media posts (12%), and getting social media friends/followers rank the lowest on moms happy meter. It's important for marketers to remember that beyond being a mom, she is a woman first and foremost. In order to help her be the best mom and woman she can be every day, brands can show they care by providing her with self-care strategies and teaching her how to live a more balanced lifestyle.